1300-year Oak-champion and 1000-year Old-oak grow in the village of Stuzhytsya, Velykiy Berezniy district and are the candidates for “National Tree of Ukraine” All-Ukrainian prize. The Oak-champion took the third place in “The oldest tree of Ukraine” nomination. The title of “The memorial tree of Transcarpathia” was given to the 500-year london plane that grows in the “Horkiy Park” in Uzhhorod. The Trufanets Falls is the highest natural waterfall of Transcarpathia. It is 36 m high. The waterfall is situated near Yasynya-Rakhiv road on Trufanets stream the right effluent of Chorna Tysa (Black Tysa) river on the south-eastern hillside of Svydovets mountain range. The fall is formed in the place of hard sandstones exposure. The stream rises in subalpine belt at the height of 1720 m at the bottom of Blyznytsya mountain. It is 2830m long of which 230 m underflow in the forest belt. The stream makes several leaps in it’s descent. Lake Synevyr is one of the seven natural wonders of Ukraine. It emerged 10 thousand years ago at 989 m above the sea level. The lake is fairly considered to be the most precious natural treasure of The Synevyr National Park and is one of the visiting cards of the Ukrainian Carpathians. The average square of the lake is 4-5 hectares, the average depth makes 8-10 m, the maximum 22 m deep. The museum was opened in 1970 and represents the Transcarpathian traditional folk architecture heritage of the 17th the first half of 20th cen. The great collection of traditional folk art is on view presenting the works of pottery, farriery, weaving, embroidery, wickerweaving, carving. 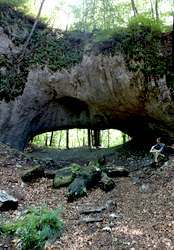 Wonderful creation of nature – a unique natural arch, which was formed as a result of karst processes, according to scientists, on the seabed. 500 years ago, when Christianity celebrated its 1500-year anniversary, here in the very heart of Europe, the cult of the heathen flourished, who worshiped the sun. It is on the karst bridge where their temple was, as evidenced by stock materials and the discovery of interesting artifacts. The bridge is located near the village of Mala Ugolka, Tyachіv area, on the territiry of the Carpathian Biosphere Reserve.